We welcome two pets per apartment home. Please call the leasing office for more details. Some restrictions may apply. 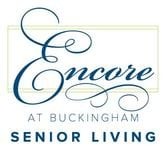 Encore at Buckingham recently completed a multimillion-dollar renovation, and offers top-of-the-line amenities that are second to none when it comes to retirement communities in Richardson, TX. You can enjoy a resort-like atmosphere where world-class shopping and dining are mere minutes away. Our in-home features include luxuries and upgrades like hardwood floors, plush carpeting, ceramic tile, custom cabinetry, stainless steel appliances, and quartz countertops, making our apartments stand out and shine. Our Richardson, TX senior apartments community offers garages, carports, and storage rooms; in addition, each building has an elevator for easy access to get you where you like, when you like! The pool area has an outdoor cabana and grilling station and is a wonderful place to entertain friends and family. In addition, we offer a light complimentary continental breakfast Monday-Friday. Our senior housing in Richardson, TX also offer transportation services, making it easy to do grocery shopping, go to doctor appointments, and more. Our residents enjoy special outings as part of our activities, too. Encore at Buckingham has a beauty salon, game room, library, movie theater, and many other unique features, as well. Contact our staff today for more information.